This project went on for sooooooo long! In a way, now that it's all done, it's kind of like "what's the big deal?" 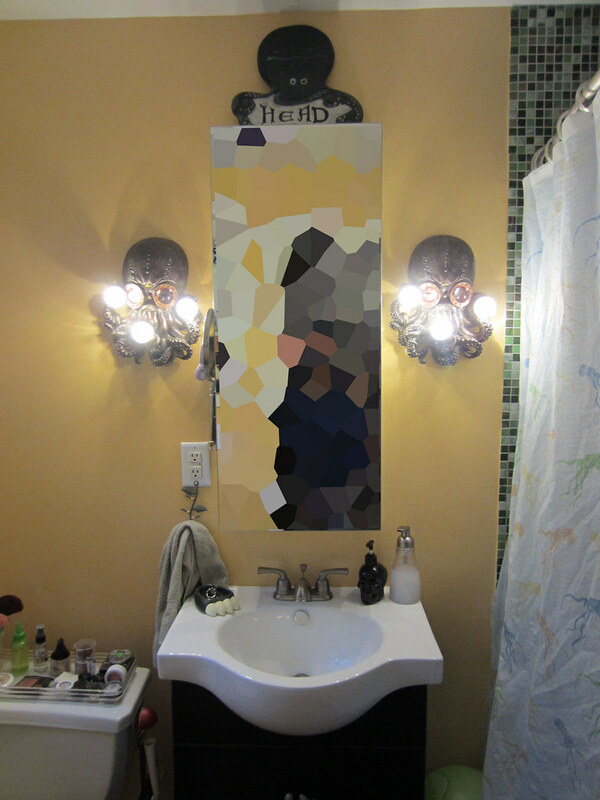 Well, the big deal is, I'd been needing to redo my bathroom for a few years, was actively saving up for it for months, and had been wanting some octopus lights foreeeevvvvver! So let me show/tell you what I'm talking about. I have one small bathroom in my house. In the 10+ years I've lived here, this is the second time I've renovated it. It was damaged when I bought the house, and then I got a cut-rate hack job which after a few years led to the bathtub actually cracking on the bottom. Unfortunately, this happened while I was in the midst of my extended involuntarily vacation, so I was left with no recourse other than to stand awkwardly while showering, in hopes of not crashing through to the crawlspace. When I went back to work, one of my main priorities was the bathroom. And the priority of the priority was...octopus lights. 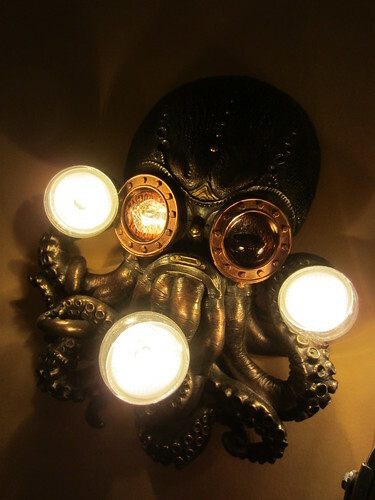 While I was saving up, I was researching like crazy, trying to find someone somewhere who made octopus lights I could use as main lighting for the room, as opposed to some small accent light. Came up with nothing. Even on Etsy! Really, check for yourself! In any case, the answer was — as it so often is — make them. 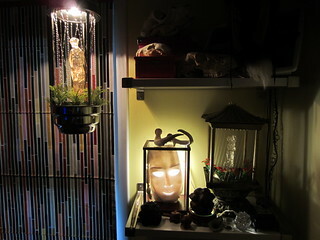 I refocused my search on finding some kind of statue or plaque that I could wire for lights. Now, if you're looking for statues, you'll find tons. I narrowed it down to three, and ordered all of them. I was really rooting for the one on the left, which is intended as a candelabra, and seemed like it would be the easiest to wire up. It was also meant to sit on a table, though, so when I put it on the wall, it just...did not work. The middle one was my second choice, because I liked the coloration of it, and the side-set eyes were cool. But I couldn't come up with a good plan for bulb sockets, so it went back, too. 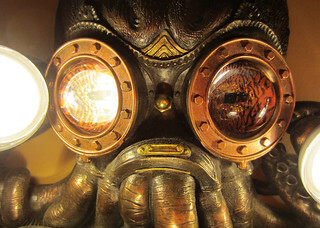 Left me with my last choice, the "steampunk" octopus. A little ironic, that, because now, it's my favorite of the three, and they worked so well. Shaved, epoxied, and painted socket, with dry-brushed collet nut finish. They're still small curls, though, so full-size bulbs wouldn't work. That meant more research on candelabra bulbs to find some that would give enough light, sans heat, and would still look cool. Let me tell you, I had no idea how many kinds of lightbulbs there are out there. I mean, why would anyone? I've been buying the same CFLs for a decade now, so I hadn't even been paying attention to all these LEDs and stuff. But man, I found some cool ones. I got some little candelabra sockets at the local Lowe's, which almost fit into the curled tentacles. The plaque itself is some sort of resin, so I decided I could open the space a little with my Dremel, to get the sockets in there. Luckily, I decided to talk to my cousin Rob about this project, and he said the sockets would be easy to shave down, with less potential for disaster. See, this is why you sometimes just need a second brain on a project. Rob got interested in the whole idea, so he came over and the two of us sat out on the deck, shaving down plastic lamp bases until they fit nice and snug. Then we filled in any gaps with epoxy to keep them stable. The eyes are super cool in person. 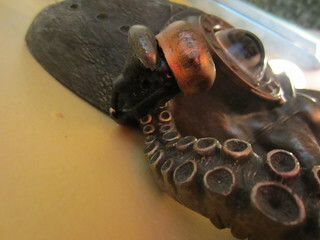 The sockets were plain black, which worked fine since most of it was behind the tentacle, but the raw top edge was pretty ugly and unfinished, even with a bulb set in it. I found some nice rounded collet nuts at the hardware and decided those would make an appropriate finishing touch, with a little bit of paint. So I spray painted them matte black, and then dry brushed some copper. They really look like a part of the sculpture now! After looking all over the place for just the right light bulbs, would you believe I found them at Kroger? Yeah, shopping for cheese, found the perfect lights! Dimmable LEDs with clear globes. 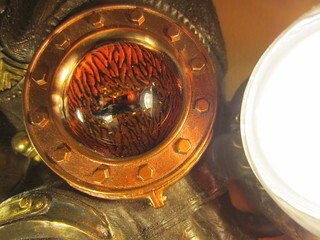 They suited the octopus so well, with its big glass domed eyes. Rob helped me wire all three sockets together to be suitable for the existing wall location, and they were nearly completed. The last thing I hadn't really figured out was how they were going to mount to the wall itself. 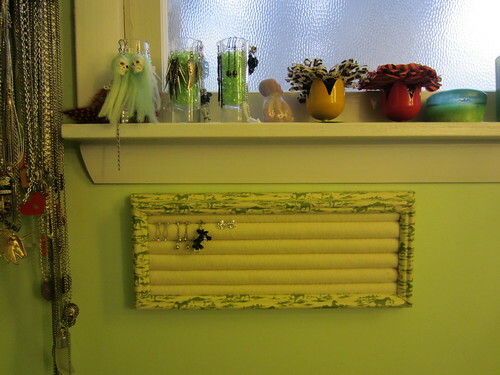 Because these were just meant to hang, there was a fabric cord moulded into the back to hang on a nail. Obviously, that wasn't going to work. I thought we might have to install some sort of keyhole hanger, but after looking at how my previous lights were mounted, we figured it out. It was going to involve drilling right between the eyes. That acorn nut right in the middle there. This made me very nervous! Rob found some nice small, and appropriately colored, acorn nuts, though, and after testing out how it looked, not only was I not bothered by the exposed hardware, I decided it really added to the overall look! So Rob took them to his drill press (no way I was doing this with a hand drill), cut and slotted some threaded rod to be deep enough to accommodate the rather thick material, and we were good to go! Now came showing the contractor. I told him this room really depended on these lights. All the colors in the room were based on the lights. This whole project was planned around them! (That's not entirely true — the foundation of the room was actually the big-as-possible Jacuzzi tub, but still.) He was pretty tickled by them, which made me happy. I was concerned there might be a moment of "what kind of hack job lights are these, you can't expect me to put something like this up!" But no, he was all for it, even though it was going to mean moving everything on that wall over a few inches to keep the much wider new lights out of the shower. At least, he was all for it until 3 weeks into the 2 week project, when he messaged me at work to say, "The lights aren't going to fit." I got up out of a meeting and said, "I'm on my way." No way had we made it this far to quit. There was no Plan B. He was just reluctant to move the sink and the wiring over further than he thought he was going to have to, because it turned out the new tub was a couple inches wider than the previous one, which meant the whole room already shifted. (And I now have an entry door that's a couple inches narrower than normal. You'd never know.) I talked him in off the ledge, and he did an excellent job moving and centering all the necessary elements. So, this is the new bathroom! I won't bother with pictures of all the other stuff, the new floor, tub, shower tile, etc. Because this is aaaaalllll about the octos. Even the wall color was chosen to highlight the copper shading, and the narrower wall cabinet was also a compromise to get them in there. Yes, that big abstract thing between the lights is a mirror; no one needed to see me standing there with my camera. Everyone who has seen pictures asks the same thing: "Where did you get those??" Which is my cue to say my favorite thing in the world: "I made them myself." Estate Sale Find! 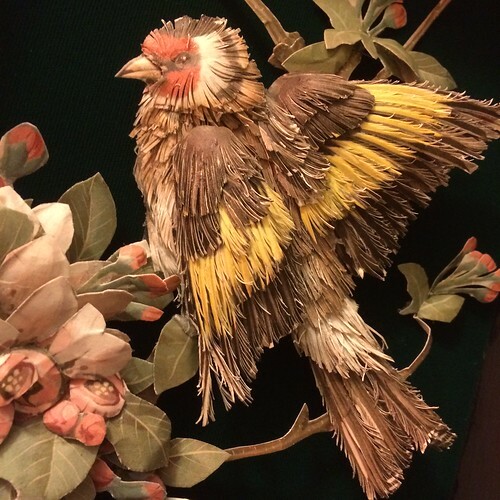 Paper art gold finch. I have been a connoisseur of the second-hand for most of my life, but in the last year or so, I've been hitting the local estate sales pretty hard. And by "local," I mean anything within, oh, up to 50 miles. The focus of this site has always been stuff I made, but when I was organizing some photos this weekend, I realized how many pics I had of random/recent estate sale finds, and decided it would be fun to start sharing them. So here's the first one. This is a closeup of an amazing little piece of art I got at an estate that had a good 6 or 8 of these life-size, cut/layered paper birds. There were blue jays, cardinals, and the big one, three cockatoos—again, life size! I gravitated to the gold finch because of the (middling) size of the piece and the contrasting black background. In pencil on the back of the piece was written, "Gold Finch, Basil Ede." Great, for once I have the name of the artist! When I got home, I looked up Basil Ede. Turns out, he is the originator of the illustration that the paper artist then turned into this dimensional piece. So I still don't know who actually made the piece. It was already framed in a rather ugly finish, I have to say. The wood was that mid-tone that dominated in the late-60s/early-70s, with dark grain... just didn't like it. I had no issue with repainting the frame glossy white, as I didn't think that was altering the art in any way. And here it is in its place in my living room! That's a big ol' steer skull there, which may give you an idea of the size. I had sent my mother a picture of the piece when I got it from the sale, in the original frame and all, and she said, "And what are you going to do with that?" What am I going to do? Put it on the wall! It actually looks really good in the space, the bad lighting of that photo aside. Maybe some day I'll find out who actually made it. This is going to be a quickie, because I don't have any photos. I didn't take any while I was making it, and I keep thinking I'll take better pictures of the finished product, but...I keep not doing that. But I still wanna show it off! 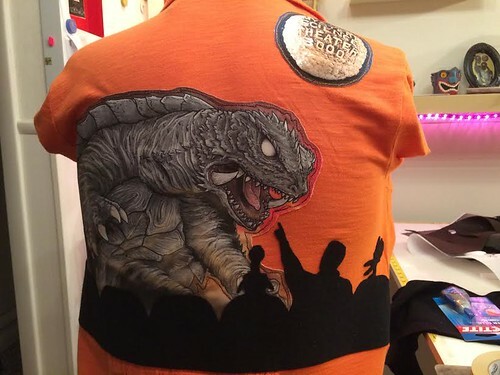 The plan was to have Joel and the bots in silhouette across the bottom of the jacket, watching Gamera. 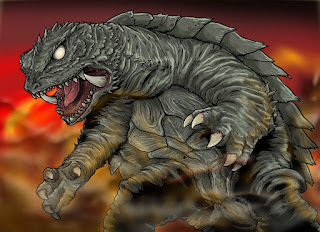 I started by seeking a Gamera image that I liked. After looking at many MANY movie stills, I found this awesome illustration, which did not have a creator attached. 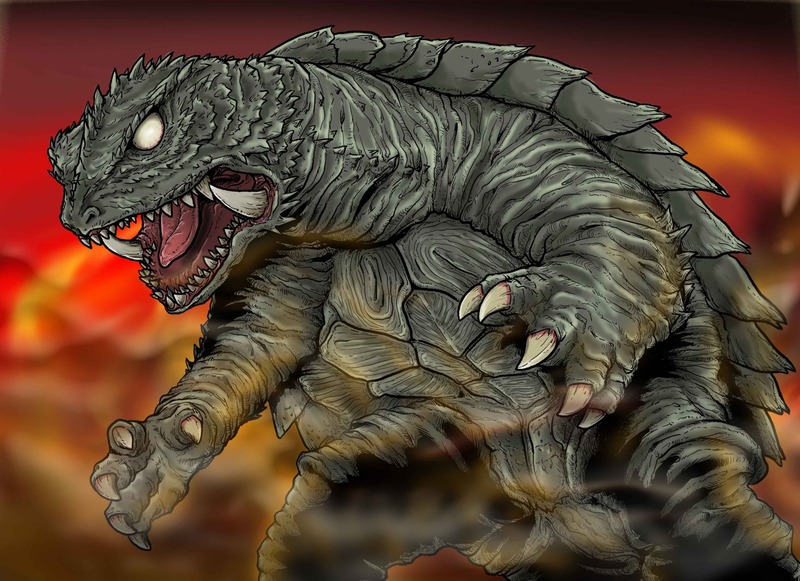 I wish I could find out who did it, because it's awesome, and the same artist did several other fantastic kaiju illustrations. I positioned it on the back of the jacket, and then free-motion stitched a rough outline of the beastie's shape, going over it a few times. Then I carefully trimmed the excess print away, to give it a cooler look. I felt like the sky needed something, so I repeated the process with the MST3K planet logo (the Satellite of Love wouldn't quit fit the layout). For Joel and the bots, I traced a vector version of them in the theater seats, and used that to cut the shape out of felt with my Silhouette Portrait cutter, after adhering heat-n-bond to the back of the felt. This is important for two reasons: felt needs stabilization to be cut with the Silhouette. Further, stitching around the complex shapes to attach it to the jacket would have been paaaaaaaaiiiinful, so this was a preferable option. That's pretty much it! Print-stitch-trim Gamera, print-stitch-trim MST3K loto, cut-iron-on theater silhouettes, and you get...THIS. Yeah, it's not a great picture. But every other time I think about taking a better picture, I'm already wearing it. I wear it fairly often, usually to great response. There are more MiSTies out there than you think! Welcome to Sew Mama Sew Giveaway Day 2015! This giveaway is CLOSED! Our winner is commenter #6, Rachel! How could I possibly resist an eclectic 9 year old, especially having been one myself? Rachel & Co.'s new tie is in the mail, and after it gets there, hopefully they'll send me a picture in action to share with everyone. Thanks to everyone for the comments and visits. My first Giveaway Day was a lot of fun, and I'll be doing it again next time, so stay tuned. Welcome to Sew Mama Sew Giveaway Day! This is my first time participating in the extravaganza, so let me get right to the goods. 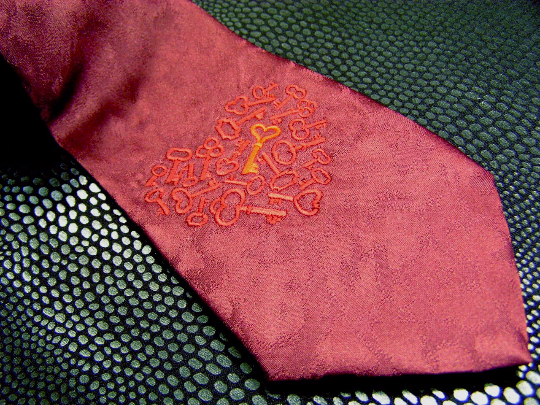 From a series of customized ties which I had listed on my (currently on hiatus) etsy shop. 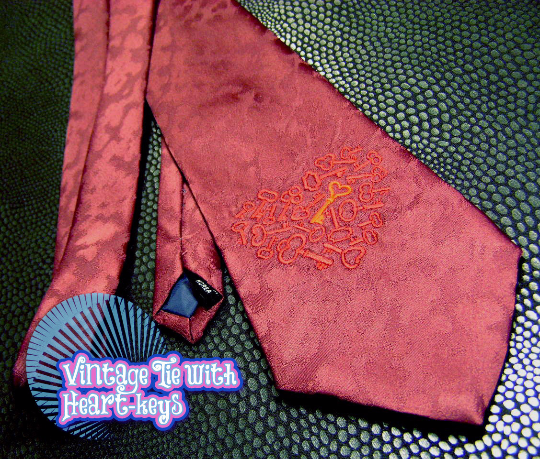 This vintage Wentworth tie is 4" at the widest and 58" long, made of 100% polyester. Digital colors are approximate. • Giveaway is open from now until Sunday, May 10 at 8 p.m. Detroit time (EST). • I will ship internationally. • Make sure you have an email address attached to your comment! This is how I will be in touch to get your shipping information. • If my first choice of winner doesn't respond within 24 hours of my message, I'll move on to the next choice. Here's something I haven't done before... Giveaway Day this week! 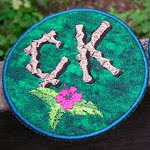 I am going to be taking part in the Sew Mama Sew Giveaway Day this week, May 6th. I've been reading Sew Mama Sew for a long time, but have never really paid much attention to this event...somehow! On Wednesday, I'll be posting up what item I'll be giving away. I have a few choices, and I haven't entirely decided yet, but it'll be something good, from my store. "Entry" details will be posted then as well. So come on back for the full story, and dig right in to Giveaway Day (actually a week!). There are sure to be dozens and dozens of fantastic things in the offing. 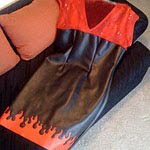 Have you ever had a scrap of fabric that you desperately wanted to do SOMETHING with, but it was too small (or too flimsy or too obnoxious…) for most projects? Somewhere, I acquired this little piece of cream-colored cotton with green running horses on it. Smaller than a fat quarter… genuinely, no idea where it came from. But I LOVED this little scrap and have always known exactly where to find it, while waiting for the right project to come along. Meanwhile... For the last couple of decades, I haven't been able to wear earrings without my piercings getting inflamed and painful. (Damn waste, since I have 7 total [artificial] holes in my ears.) I figured I'd developed some kind of allergy, and experimented with different earring types for a while (silver, gold, surgical steel, platinum, etc.) before just giving up on earrings. Then, not too long ago, I discovered nylon ear wires and decided to give those a try. And hey, what do you know, I could finally wear—and make—earrings again. 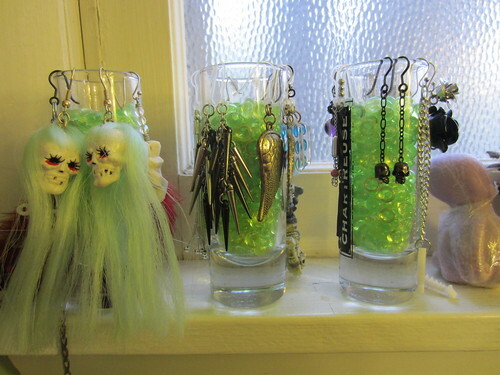 They had to be danglies, which was fine with me, since those are fun to make and wear. I made a handful of nylon-hooked pairs that became favorites. At some point, I dug up some steel posts and decided I just wanted to wear them, hot earlobes be damned. And I did, and it was fine. Then I got some more posts, and found I could wear those, too. My refound tolerance launched a whole new era of ear décor. The problem with studs/posts is storing them. The hooks are easy—they're hooks. Hanging is what they do. In my case, my most-worn lived in the bathroom (with most of my go-to jewelry) over the edge of tall shot glasses (filled with acid green plastic beads). Before long, though, I had a little…pile of posts on the windowsill, just asking to get lost. Enter Pinterest! I looked for some storage/display ideas, most of which just took up too much space. I did find one idea, though: felt-wrapped pencils, smashed into a drawer, with the earrings tucked between like a ring display. A good start! I went to the local Sally (Salvation Army, you nerd) to look for a frame, something with a little depth but not too ornate, nor too big. And what did I find? Well, first of all, I found a VISIBLE BAT, y'all, still sealed in the box!! I have a thing about visible ______s and anatomical anythings, really. 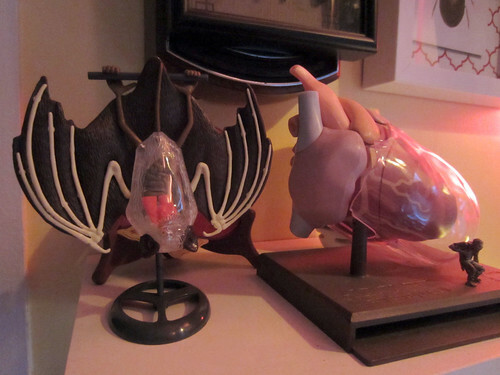 Thus, the bat and this heart model here. 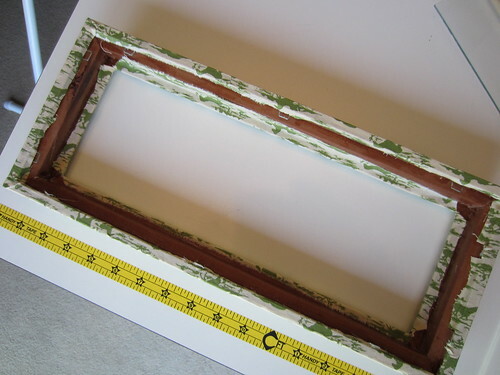 Back to the point, I also found a decorative shadowbox sort of frame with some super tacky ribbon flowers in it, an inch or so deep, and about 15" x 4". 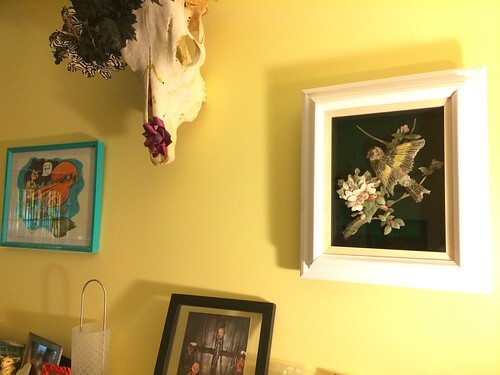 First step, tear out the hideous…art and throw it away. (I would have burned them, but I'm sure the fumes would have killed me.) Then I'd have to cover the gross brown—HEY! 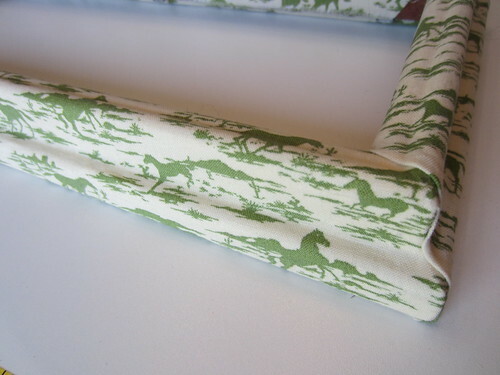 HORSE FABRIC! I've never really Mod Podged anything, but I've seen it done, so I just hacked at it. Got the Fabric formulation (probably not necessary), and put on a not-too-thick coat. Wanted to make sure the fabric would follow the contours, but not get soaked through. 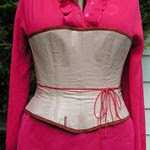 Did the long sides first, smoothing down long strips and running a nail along the indents to get the fabric in there. Oh, and made sure the ends turned those corners a little, to be covered by the short sides. The short sides were the only tricky thing about the whole project. Smoothed the strips the same way, but up at the corners, I folded the raw edge in and pressed it along the miter line. It was kind of fiddly, but the Mod Podge is super workable, so I just kept at it until it was smooth enough. 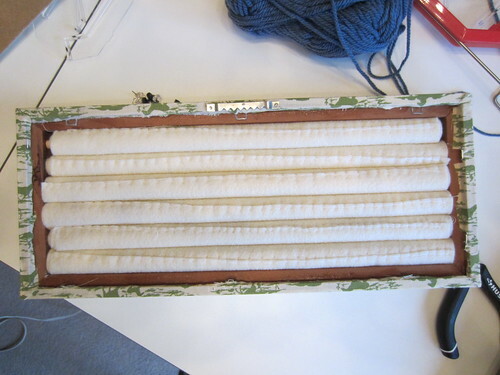 For the rods, I got enough doweling for six 5 15" lengths, and a yard of cream-colored felt. I had to experiment a bit to figure out the right length for the wrapped dowels to fit in snugly* together. After a couple of tests, it turned out to be 10" (by the 15" width). For each dowel, I hot glued the dowel along the long edge, and rolled it up tightly. 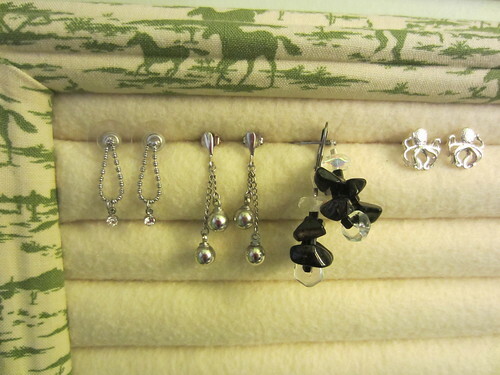 It's all about tension, so if the felt is loose, it's not going to hold the earrings. (Maybe. What do I know.) Then I sat on the sofa and stitched down the free edges (rather than gluing, because I have a fear of commitment). The blanket stitch was probably unnecessary, but I like things neat. 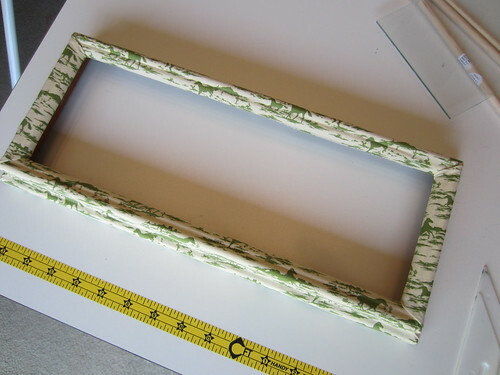 Stuff the dowels into the opening, replace the back that came with the frame, nail on a little hanger, and that's it! If my bathroom looks very green in this picture, it's because my bathroom is very green. It was also close to dusk, when that room looks craziest. Because the room where you want the whackest lighting/colors is the room where you dress and put on makeup, right? Yeah, I thought so, too! *I DID IT AGAIN. I swear I'd completely forgotten about my string of "snugly" until I was editing this post and saw that I'd used it AGAIN. New stuff in the shop—ties! 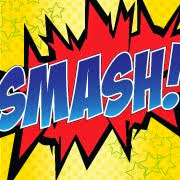 I've opened a new section at my Smash Patch! 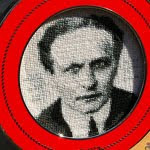 Etsy shop for a series of embroidered ties I've been working on. These are all vintage ties I've hand-picked and then machine embroidered designs (and colors) that I thought fit them. 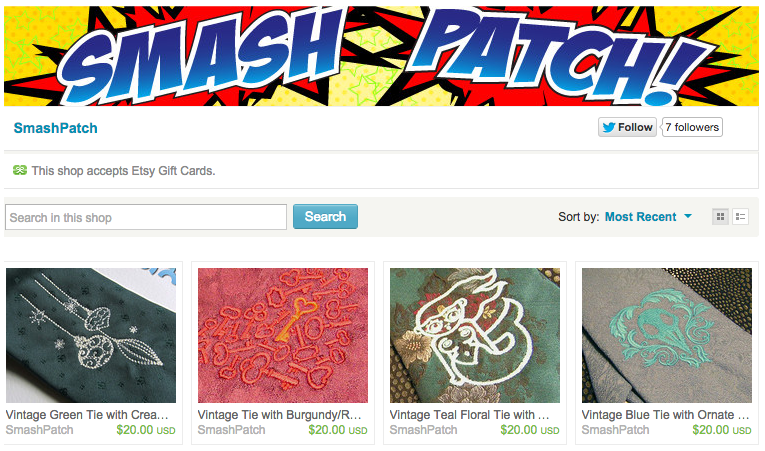 There are four ties in the shop right now, and in the next few days I'll be adding more. Check 'em out!